Yakuza and Shoujo of “Wild Ones” = Love in the Air! Yakuza Princess meet World and Entities! Sachie Wakamura never imagined that she would lose her beloved mother, but she did. Since she was a minor, she was sent to live with her maternal grandfather who she has never met. Her grandfather is revealed to be the head of a yakuza gang. So you can imagine Sachie’s dismay as she was assigned a bodyguard, and forced to conceal her family’s business. There are more adventures for Sachie, as she goes through high school, foremost is considering her feelings for Rakuto Igarashi, her bodyguard/caretaker, and any other plot development or character interaction the mangaka writes in. This is a fairly normal shoujo title variety, with beautiful girls/boys, love triangles, and happy endings for all. Why am I even thinking about recommending this series, for several reasons… some superficial and some profound. I have been on a slight shoujo kick, so getting to read this entire series was courtesy of Teen Central at New York Public Library. Hard boiled looking male supporting characters. I love the romantic image of Yakuza… reminds me of specific characters. Quite cute to read through. Sadistic yet pretty boy male lead, with a clumsy yet sincere female. Plenty of romantic imagery is in the series. I loved the covers for a majority of this manga series – all with red backgrounds, and nice pose. There are some spoofs with the covers, that warrants a chuckle or so. If you are attracted by this entry, do check out this ten volume series by Kiyo Fujiwara and released as part of Shojo Beat’s line of manga. There’s a preview of the actual manga on the Shojo Beat site. You may or may not know this veteran seiyuu (voice actor), but Yuji Mitsuya was a guest at Otakon. Many of his roles are of older titles, that you possible could have seen or not. (Ranma 1/2, Saint Seiya, Touch, Stitch! etc.) He also has roles that are outside the realm of anime, such as being the Japanese dub for American films. At this point of his career now, he is the sound director, who’s roles is to cast, and see what type or roles fit for an anime. His well known projects as a sound director include, 5 Centimeters Per Second, Rurouni Kenshin, and Yu-Gi-Oh. These were points mentioned during his press conference. These are notes from what I wrote down. Mitsuya’s Take on the field of voice acting. The emergence of idol singers like Nana Mizuki definitely brought awareness of popularity to the voice acting field. The field of voice acting is now much more narrow and compartmentalized, as compared to years earlier, when voice actors were also television actors, now there are people specifically trained to be voice actors. There is a five year mark for voice acting, once beyond that, then there is an individualized character opportunity. Best to be able to gain as much experience as possible, so Mitsuya advises to act on stage to get a variety of skills. For Japanese original produced work, the seiyuu has the freedom to create something new. But with dubbing roles, there is a role already created, so the work is maintain the original work, but also create a Japanese feel to the project. Or at least that was the case when Mitusya worked on Back to the Future’s Marty Mc Fly’s character, now a change in Japanese dubbing is to just mimic the original actor. Mitsuya on perspective on roles that he didn’t get. There was one project, Rokushin Gattai God Mars, he auditioned for the younger brother, but got the older brother’s role instead. His role became so popular, the production team resurrected his character, and gave additional projects to Mitsuya. Another role he didn’t get was the dubbing of Jar Jar in the Star Wars movies, so when the anime the Clone Wars came, he got the part of Jar Jar. The motto of these stories are if you want it hard enough, it will come for you. Mitsuya on transition from seiyuu to later roles as well as sound engineer/director. He was reluctant for his initial role as a sound director, but with experience, and production teams wanting his experience. He fits into the role now. Spoke about empathizing with younger voice actors. Because of his own experience in voice acting, he knows what the younger actors are feeling. Clear difference between being a seiyuu and a sound director, in being a seiyuu – he would only have to worry about his own role’s lines, but as director – he worries about everyone’s lines. Easier being an actor than a sound director, but if Mitsuya would want to work on both roles. 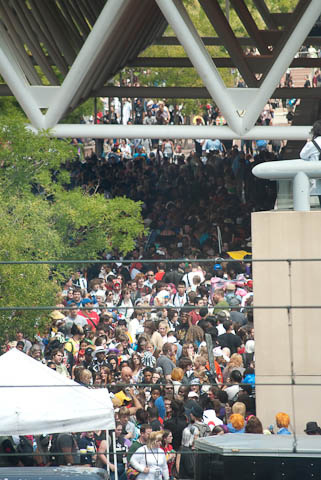 So this is my press coverage on on Otakon 2010, be sure check out Anime Diet’s Flickr for photos from Otakon. Also be on the look out for Jon’s video coverage of this convention. Home Made Kazoku, referred to as HMK was Otakon’s Sunday Concert, so this was their United States debut. Anime fans of Bleach, Naurto or Eureka 7 would have heard of this group, from their catchy endings. To the delight of many screaming fans who were lucky to see them at Otakon this year, they are a great upbeat band to listen to. DJ Micro and DJ Kuro knew English fluently, and definitely knew how to appeal to the crowd. It was a great rousing way to end the concert. This is what their set list was during the concert, and was supplied courtesy from Alyce Wilson at Otakon Press. Jon, I know was able to grab some photographs from their first four songs. That will be up, and there is still some more coverage left to be posted of Anime Diet’s run of Otakon 2010. For convention goers, Yoshida Brothers were Otakon 2010’s Friday Concert guests, and for the rest of the world in terms of Japanese anime/gamers hobbies, they would probably have heard of Yoshida Brother from the initial American Wii commercials or even their cover for Disney’s Nightmare Before Christmas Revisted album. Prior to Otakon, when I heard that they were coming, let’s just say that this was a highlight of my convention experience this year. Their appearance at Otakon is the beginning of their second United States Tour. Following Otakon, I was happy and lucky to have seen them perform again in New York, the following Tuesday. I have reported earlier, their Otakon set list, [modified August 5, 2010 with a photo of their set list in Japanese]. This post is a partial summization/transcription of their Otakon press conference, with some recent impressions from their New York concert. A bit of a history behind the Yoshida Brothers, they have been playing the shamisen for more than 15 years now, starting from the age of five years, to fulfill the dream of their father. They debuted at Japan in 1999, success caught them by surprise and then in the United States at 2003, when they introduced their brand of music to the world. Ryoichiro is the older Yoshida Brother, and Kenichiro is the younger brother. During the concert, they have used this interaction, seemingly to see which brother is the better shamisen player.The Yoshida Brothers definitely broke the image barrier of shamisen music being an aged old-fashion Japanese music. Where do you get your inspiration of music from? Ryoichiro – Hokkaido, where our home town is. What are manga/anime titles that you paid attention to or read? Were there always friendly rivalries between the two brothers? Yes, mostly because no one in their age group even plays this type of music, so they can either challenge themselves or with one another. Now which of the brothers is definitely better? Depends on the fan’s taste. True rivalry is considered of self, where there is issue of competitions difficult, yet it is also important for them to be brothers. Do they play any other instruments other than the shamisen? No, the Yoshida Brothers definitely want to master the instrument that they currently play. Taking the example of Nightmare Revisited, do other see themselves doing something different in the future? No plans for the future, but there is a desire to do more covers of interesting music. 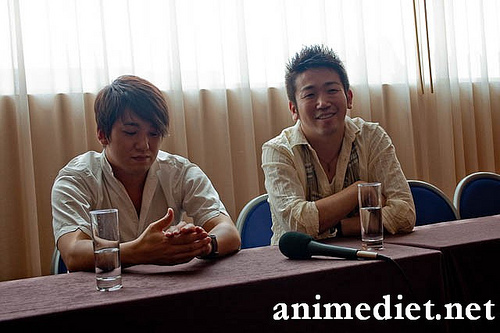 Any collaboration done currently is at the request of the other artists, so the Yoshida Brothers are waiting. Instrumental music like theirs has the important ability to inspire others when going to a different venue each and every time. Comparing the shamisen music, what western counterparts do they believe is a good counterpart to it? Shamisen music has a good combination with traditional Spanish or percussion instruments as well. What is their favorite food and region outside of the Japanese realm? How do they feel about their Western audience as compared to their Japanese audience? What are they looking forward on their United States tour? To definitely showcase what they have been doing from Japan. Since shamisen can be solo music, they strive to go beyond the traditional barrier. They would like to have a full band with them on their U.S. tour. What message do they have for their fans? Shamisen is a wonderful instrument, and the Yoshida Brothers have an obligation to spread the sound of the shamisen to everyone in the world. Now this was the extent of how much I can sum up from my notes of their Otakon Press conference. Following the next Tuesday, I was on my way to see them at the Highland Ballroom at the west end of 16th street. Now a bit of a history of my awareness of this act, at the earlier part of this year, tickets started to be sold for the Highland Ball venue. There were definitely $45 for the front row of position, and the rest of the venue was sold at $25, there was food and drink options. So my friend purchased two tickets, thus we were set for this concert.. This is an image from their Otakon concert, but it was definitely similar. The set list was the same. The performers were the same, I got to hear more closely, when Ryoichiro was thanking Ippiki, the percussionist. What made this concert different from Otakon,was the amount of people in the room, the products available that were sold after the concert, and the overall ambiance of the concert. I was definitely a bit closer to the stage, so I got to see more people, tapping to the beats of the music, or snapping away with pictures or movie cameras. There was also more Japanese people that were at this venue, what stood them out where the salary man dress, or the Japanese garb of a kimono or a yukata. 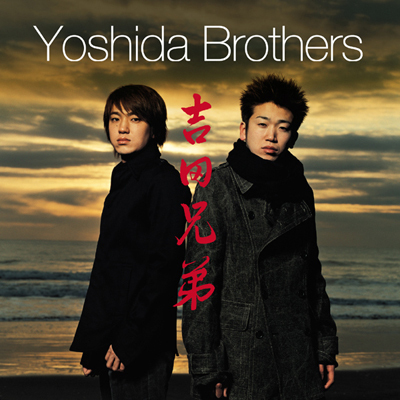 The Yoshida Brother’s second tour will have toured New York, Massachusetts, Chicago, Los Angeles, and San Francisco, by the time their concert is over. I will have my memories of hearing a good band of a traditional Japanese instruments, not once, but twice – what an experience this is. This year, Otakon had the return of Masao Maruyama, founder of Madhouse who has brought the world, Black Lagoon, Chobits, Chi’s Sweet Home, and a lot of other memorable anime titles. 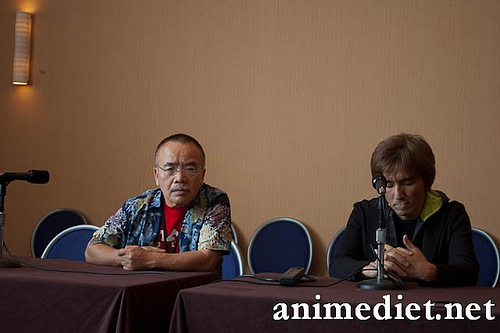 Hiroshi Koujina was also present at Otakon as a first time guest. He has been involved with titles such as, Macross Plus, Escaflowne: The Movie, Pokémon: Lucario and the Mystery of Mew and currently with Rainbow – Nisha Rokubō no Shichinin. Both of these creative personalities were both featured in a joint conference answering questions from members of the press. Anime Diet was present at this conference, so I am going to apologize for my bad recording and I will be summarizing some parts on what was the gist of the question. Also because I wasn’t aware of what specific press was there, I can only go with how much I know. Audio posting of this press conference may or may not be provided later. 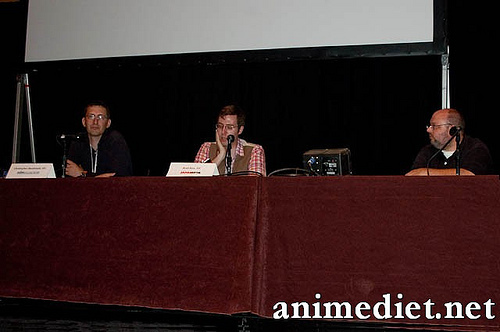 Brad Rice (Japanator)-Have you heard about talk made on the state of the anime industry recently by Dai Sato? [Otaku 2 ; Japanator Discusses] The status of the anime production in the last 15 years and onward, has been shipped out of Japan overseas into China, that there is no new blood coming from the Japanese studios Is Madhouse doing the same thing or are they actively recruiting people to stay with them? Maruyama is not aware of this issue at this time, and can not say anything for sure. There is a possibility of some misinterpretation of Sato’s comments. What he does know and is aware on some creative work done in Korea, but not the majority, since there are still Japanese creators around. Maruyama also think that some Japanese companies are lacking in effort to train the new generation. Madhouse is working with Korea, but this is not work-for-hire, where we are hiring just from Korea. We are clearly collaborating to create, it is not simply a work for money, and we’re working as a team. It is a fact that there is a concern for some Japanese companies that there is a lost of energy or there is a decrease in energy or power educate their new generation. Maruyama’s intention on how to run Madhouse is that there should always be a chance to give opportunity for the new generation to step up. Maruyama has high hopes for the new generation for example Death Note’s Director, Tetsuro Araki who currently does High School of the Dead is a young director. MC Radio, a Spanish Press, was present and he asked these questions. I was able to get his English translated questions. Q- Many people consider Dennou Coil (2007) as one of Madhouse’s strongest projects because it demonstrates, in many aspects, the ranges that anime can reach. What does this work mean for you? The director’s approach was challenging and wanted to show a new way of how to show animation. This project was attractive due to the director’s potential. Q-There has been a series of 3D film or HD films in the U.S, how much does these new technology or fads echo what Madhouse does, and with new technology, how much does Madhouse do use this in their work? For creative process, 3D can change the way a story is constructed, and the only thing is that HD production costs more than the SD process, so this is a purchasing issue. Research also costs as well. It depends on if the production team, and if their budget can support the cost of making an HD film. It is not our place to dictate what audience would need to watch HD or not, but if there is a demand, then Madhouse is always ready to answer that need. Then it is just the matter for the cost of production of who should be paying for this, the audience or the investors? Q-It the simultaneous broadcasting for anime [with sites such as Crunchy Roll], such as High School of the Dead working out, and is this a working solution for the rampant piracy that is out there? Is this a new model to be used in the future, same day in Japan and the United States? Since Madhouse is not a distributor, but a creative studio, they can’t answer that question. But from the creative side, Madhouse is happy that everyone in the world can enjoy their shows at the same time. In Japan, there is a different schedule of release times, so what comes out in America comes out later in Japan. Korea is different, they actually release American Hollywood films at the same time, it releases in the U.S., so if there are any movies Maruyama want to go see, then he would fly over to Korea to see, but as mentioned – he is happy that everyone can see Madhouse’s work. Q- What is your director style for Rainbow. If you watched Rainbow, it is not a series that is happy happy joy joy, it is a serious drama, and there are no dynamic action scenes or battle scenes. It is heavy drama, so he was careful as to how the dialogue would fit in with the scene, and how expressions would be shown on each character. Q- What are you favorite fan moments, in conventions such as Otakon or around the world? Maruyama – As the creative side of Madhouse, he is happy to see cosplay for series that is done by Madhouse. He’s been to China and Russia and has seen similar sights, where he realizes that cosplay is a phenomenon that can be shared by the entire world. Kojina – “I have always been told by my studio head, to always take care of fans. For example, when one time someone sent Valentine chocolates for one character I was involved with. I was very appreciative of that. We enjoyed it as a snack.” Kojina is also happy to see people in cosplay, such as a cosplay of Neuro of which he worked on. [Majin Tantei Nogami Neuro] That without cosplayers, then these characters can’t exist without the support of fans. Another Spanish question directed to Maruyama. Q-How has Mamoru Hosoda been performing in Madhouse, considering the creative freedom he displayed in productions such as Summer Wars and Toki wo Kakeru Shoujo? Mamoru Hosoda as a person is quite special, and directors at Madhouse always has something they want to do, and every time they need something, it is always about what they want to do and what the company wants to do. Q- What influences your work methods? Is it a creative idea or the result of research in an area, and then the inspiration strikes? Do you have a philosophy about creating works? When you work in animation, it is not an individual work, it is a team work. There is always consideration for what kind of director to work with, and how to combine them efficiently with artists. Madhouse has many talented directors, so it is always key to find right chemistry with think this group. Q- How has Madhouse Studio changed over the years from when it began, what do you feel is its strength to evolve and what do you miss the most from the old days? One clear change is that we have more people, and that equates to having more titles, but at the core we haven’t changed much, “Maybe” [mentions Maruyama to the laughter of the crowd]. Q-What do you guys think of the general trend of moé in anime, and overall greatest angle as an individual director whether or not you want to use moé in your works? Maruyama– Not sure of what the range of moé is, but feels that the trend of moé is decreasing compared to in the recently. In the case of moé, animation itself is a great tool to describe cute girls, so Maruyama always likes to present cute girls in different ways. Koujina – I have never really worked on a moé series, so I can’t say from my past experiences, but I wouldn’t mind working on it, however I don’t believe moé is limited to just girls. It could be shonen or animals, also if there is a moé point in a series; it is only part of what an entire series is for me. Koujina – His biggest fanboy moment is when he was able to work with Madhouse and Maruyama, for he was a fan since he was a student. Maruyama– He’s range is so big, that he hopes that Madhouse is gone, so he is free and can work with any director in Japan, but he is very honored to work with Madhouse directors. They [Madhouse] may not like it, but he really wants to work with Hayao Miyazaki and Mamoru Oshii. Q- What is the purpose regarding future projects with Marvel – Ironman and Wolverine? Making American heroes closer to Japan? Making Madhouse’s work closer to North America? Maruyama is a big fan of American comics, and to be specific of how they draw or the quality of it, but when it comes to story – there’s always a story he likes and a story not so much, but the intention is not to have an American hero to be popular in Japan, it is a tool to make an exciting series. The image of a hero in Japan is different in America and for instant if you take Iron Man, he’s really cool in his suit, but when he is Tony Stark – he appalls Maruyama because this rich guy who has everything, because does he have the criteria to be a hero? Q- You have the ability to leave a message for many people, so with that power – what are you going to do to make the world a better place? As he comes to United States, he has noticed there are the same concerns and cares for anime and by seeing this, he knows that by seeking what makes a good animation, he knows that it can bring the world together. Q- How successful has artistic productions like Kaiba been and how necessary are they to Madhouse studio as a whole? Q- Of all your works, that Madhouse has currently created, what is your personal stand out work of art? What was the most enjoyable one for you? Each of the projects that have been worked on by Madhouse is just as precious, because it has been made by staff that he cares about. So he doesn’t overall choose one project over the other, but since what I mention doesn’t really serve as an answer. If I must then it would be Hanada Shonen-shi which isn’t really popular in the United States, but it has strong support from major countries, so he feels strongly to the project. He likes to work with as many talented directors as possible, and as Koujina is already a talented director, fits Maruyama’s type so he continues to work with Koujina as much as possible. Q-For the many interesting exciting intellectual property that is out there, if nothing is stopping you, then what would be the ideal intellectual property to work with? Maruyama– As I said before, I am a very curious person and try to work with as many projects as I can. If I even start naming the projects, then it would be in the 1000’s to 2000’s, but off the top of my head, it is Shiton Doubutsu – literal translation is Animal Tales, yet there are currently no specific titles, I want to work with now. Koujina – It has always been his desire to work with original series, because when you work with original series, it is pushing your skills as a director and to be specific with the genere, he wants to work with shonen series, because shonen is for the young generation, so it is a time for when viewers are still maturing as young adults, so he is interested in relying his message of what he wants to say to them. This concludes the press conference. Second day of Otakon.. and my updates will be slightly off, since I won’t be able to process any of my reporting until after my the con, or when I get a steady internet connection, that I don’t need to pay $13 a night for. I was able to attend the Yoshida Brother’s Concert yesterday, and this is their set list. The reason why I think about this, is the fact that Moritheil last year did it with Kanon Wakeshima concert. I will post a more indepth feelings update maybe later, when I have that huge down time in the afternoon.